Whether or not you should meet with a company's management team is a debatable topic among fundamental investors. Those against meeting with management believe you can get what you need from the numbers and company filings. By speaking with management, you risk getting "captured" by a charismatic executive or misled by a sly one. These are all indeed risks to be aware of before meeting management. In my experience, speaking with business leaders across industries, company sizes, and geographies has been an education in itself. I've misread situations in the past, of course, but I've learned more than I've lost and have come to enjoy the art of crafting questions. Despite the risks, meeting with management also helps you evaluate the intangible factors that may not be priced into the stock. Here are a few of my favorite questions to ask management teams. What is distinctive about your company's corporate culture? This is the first question I ask. Not only am I genuinely interested in learning about the company's culture, but it also sets the tone for the rest of the conversation. Most CEOs and CFOs get peppered with questions from analysts and investors about the quarter or annual guidance. Naturally, then, most start the call on the defensive. Starting with a qualitative question that gives them the chance to discuss why their company is a great place to work has in more than one occasion dramatically shifted the conversation's temperature. 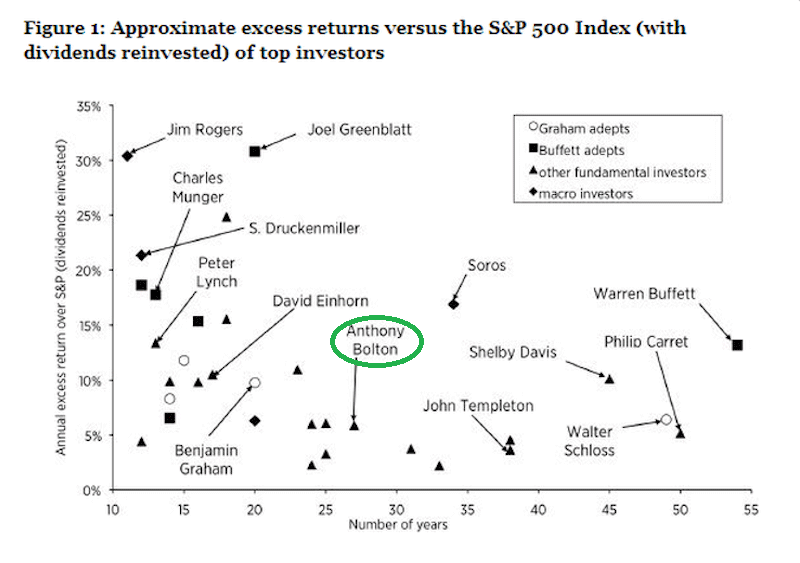 If you had to live on a desert island for 30 years and could only invest your life savings in the stock of one of your competitors while you were gone, which one would it be? This question has generated some good leads. When a company speaks well of a competitor, that's usually a sign the competitor is doing something right. Some executives prefer to punt on this question - and, of course, it's worth asking yourself why they'd punt. When this occurs, I'll replace "competitors" with "customers or suppliers," with the idea being to find out which companies might be worth further research. What has the company done to widen its moat over the past year? The phrasing of this question requires the executive to know the company's core durable competitive advantages (its "moat") - which is not always a given - and then know how the company has deliberately improved upon that advantage. For example, if the company's moat is brand-based, you want to learn how management has made the brand more valuable. If it's a low-cost producer, how has the company improved cost controls? Could you please walk me through your M&A process? What I'm looking for here are signs of a repeatable and thoughtful process. Is there a dedicated acquisition team? How are they valuing targets? When do they walk away from deals? Have they walked away from deals? What's been the biggest change in your industry over the last five years? Companies don't operate in a vacuum and it's important to know how industry dynamics have impacted the business. Has there been consolidation? Did a big company go bankrupt? Did manufacturing move overseas? What are you doing that your competitors aren't doing yet? This is one of Philip Fisher's questions. It's perfect as it is and I love Fisher's emphasis on the "yet." It's a good starting question for economic moat evaluation and it can also help you determine if management is taking new competitive threats seriously or not. In what ways is technology an opportunity and in what ways is it a threat? Software is increasingly able to replace labor- or capital-intensive operations. You want to find out which parts are most threatened by this development, but also which parts might benefit from technology (i.e. lower costs, streamlined operations, etc.). If I had sufficient capital, what would stop me from competing head-to-head with you in year one? Here, what I want to find out is if there are any barriers to entry beyond capital. If returns are good enough, capital will find its way into the industry. So, in order for an economic moat to be present, the company has to do something (customer relationships, manufacturing know-how, access to a scarce asset, etc.) that money alone can't buy. What do investors underappreciate about your business? This can be an effective question for mid- and small-cap firms (due to less sell-side coverage) and those that have secondary or tertiary business lines. Here's an example. I was speaking with bank CEO whose company had a fair amount of sell-side coverage. When I asked him this question, he said (paraphrasing), "You know, the analysts that cover us are bank analysts and they don't ever ask about our (multi-billion dollar AUM) asset management business." He then went into detail about how well the asset management business is doing. That was a signal to start digging into the asset management business to verify the CEO's claims and determine whether or not the market was taking that operation into account. What's your philosophy on buybacks and dividends? Again, what I'm looking for is thoughtfulness when it comes to capital allocation. Have they considered the positives and negatives of both and determined the optimal mix? Why is it the optimal mix for their shareholders? Do they properly use buybacks or do they have an ulterior motive (i.e. boost EPS, offset dilution, etc.). On dividends, I want to find out if the dividend policy (if there is one) is appropriate for the firm. A highly cyclical company, for instance, will ideally have a small "normal" dividend followed by a special dividend in good times. Firms with more predictable cash flows, on the other hand, can reasonably target a higher percentage of free cash flow or earnings to return each year. Who covers you well on the street? There are two benefits to this question. First, if there's a sell-side analyst who has covered an industry or company for a long time, they can be valuable resources for learning the company's backstory, which managers are talented, and which competitors pose real threats. Second, I want to find out if management only recommends analysts who currently have "buy" ratings on their stock (which tells you something) or if they care more about which analysts follow them thoroughly and honestly, even if they might disagree with the analyst's current rating. If your company didn't exist tomorrow morning, what would your customers miss about it? This question also touches on the company's economic moat sources. If the company disappeared and its customers could easily switch to a competing product and wouldn't miss doing business with it, then it's difficult to justify the existence of an economic moat today. What do your customers complain about the most and how are you addressing that issue? One reason I like this question is that it helps me determine whether or not management likes to own up to its mistakes and the company's flaws. If they sidestep the question, that's a problem. Every company has shortcomings. It also helps me gauge how pressing the problem is and if the company is fully engaged in the process. I can't tell you how many times I've heard, "I just don't have the time to read." This could suggest the executive is overworked or unorganized - and neither is an appealing trait. A CEO who likes to read, in itself, is not reason enough to invest, but it is an indication to me that he or she is intellectually curious and looking to improve themselves and the business. At least once in every conversation, I aim to follow up a question with, "Why is that?" It's such a simple question, but it gets closer to the heart of the matter. By understanding the governing principles of a business or management team, you can better anticipate what the next moves might be. I hope you found these questions useful and can improve upon them when doing your own research. One of the unexpected benefits of working overseas early in my career was learning about investors I probably wouldn't have come across until much later on. British investors like Nick Train, Neil Woodford, and Terry Smith, for example, have influenced my investment philosophy in some fashion. The subject of today's post, Anthony Bolton, also fits into this group. Bolton ran the Fidelity Special Situations Fund in the U.K. for 28 years ending December 2007, posting incredible annualized returns near 19.5% while at the helm. Suffice it to say, there's a lot we can learn from Bolton. His tenure coincided with another famous Fidelity fund manager, Peter Lynch, whose foreword to Bolton's book, Investing Against the Tide: Lessons From a Life Running Money was alone worth the price of admission. I stress hard work, an information edge and flexibility because few cliches have done more damage to investors' wealth than the phrase 'play the market'. What distinguishes investment winners...is the willingness to dig deeper, search more widely and keep an open mind to all ideas - including the idea that you might have made a bad call. He or she who turns over the most rocks, looks over the most investment ideas, and is unsentimental about pas choices is most likely to succeed. The book's worth a read for intermediate and advanced investors. The organization is messy, unfortunately, but there's rich content inside. Bolton's recollection of company meetings serve up some great lessons. Those managing money will appreciate his thoughts on portfolio management, as well. Here are 13 gems I double-highlighted while reading the book. Often, I ask myself a very simple question: 'How likely is this business to be around in ten years' time and to be more valuable than today?' It's surprising how many businesses fail this test. Sometimes the names of the institutional shareholders (of a company) will carry information because there are some I rate more highly than others and if one or two I rate are on the list that's a positive. The ultimate commendation is when a company talks positively about a competitor...In fact, as a general rule, when a company says the opposite of what you expect them to say I put a double weight on it. (Good managers) tend to be fanatical about the business, working long hours and demanding high performance and excellence from their team and they are reasonably self-assured and on top of what they do without being arrogant. Seeing through spin is one of the most important aspects of the job. I prefer thinking in levels of conviction rather than in price targets. The (stock) price itself influences behaviour - falling prices create uncertainty and concern, rising prices create confidence and conviction. Understanding this is a really important part of investing. A portfolio should, as nearly as possible, reflect a 'start from scratch' portfolio...One of the things I do each month is an exercise that helps me measure my conviction. On a piece of paper I write five headings across the top: "strong buy", "buy", "hold", "reduce" and "?" I don't normally make large adjustments to the size of my holdings in one go, my moves are incremental. When I've analysed the biggest mistakes I've made over the years they have nearly always been in companies with poor balance sheets. Thinking like a short specialist is a good discipline for most portfolio managers...If you are aware of what might go wrong in a company (knowing the counter investment thesis) one may be able to spot before others the fact that it is going wrong. It's rare that you only get one chance to make a trade at a specific level. I've always thought that the best environment in which a fund manager could perform well was one in which they didn't know how they were doing. == Earlier this year, I was invited by Harriman House publishers to contribute a chapter to their forthcoming book, Harriman's New Book of Investing Rules: The do's and don'ts of the world's best investors . I contributed a chapter on dividend investing and can't wait to read the 50+ sets of rules written by some of my favorite investors including Vanguard founder Jack Bogle, Nick Train, and today's subject, Anthony Bolton. One night a few weeks ago, I sketched out my investment philosophy in a “one pager” format. I found the process to be useful, so I shared it on Twitter before heading to bed, thinking others might give it a try themselves. In the morning, I discovered the post was going viral - at least FinTwit's version of viral. The feedback on the post was overwhelmingly positive, which, while appreciated, also made me a little nervous. A cheery consensus around a company or a strategy doesn’t lend itself well to outperformance. That said, there’s a difference between prescription and practice. Advocating regular exercise is sound and non-controversial, yet the temptation to be remain sedentary can be hard to overcome. Indeed, part of the motivation for doing the one-pager was to hold myself accountable and stay focused during a bull market when there's pressure to relax standards. The one-pager isn't meant to be a magic formula of any sort. No company will check off all the boxes. Instead, it serves as a personal framework for evaluating businesses and investment opportunities. Most of the questions I received about the one-pager regarded the three highlighted sections below. To be a “strong buy,” I want the company to have an economic moat, be managed by excellent stewards of shareholder capital, and trade at an attractive valuation. These opportunities are rare, to be sure, but it's good to know when you might have a "fat pitch" heading your way. 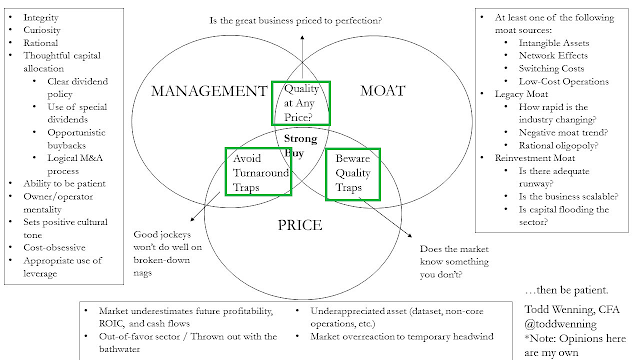 The highlighted sections address three challenging - and comparatively more common - scenarios that quality-value investors encounter. In each case, two of the three requirements are present, but one is missing. Here, I’ll address the problem, pitfall, potential, and process for analyzing companies within the three scenarios. Problem: Great companies don’t always make great investments. Pitfall: Even if the underlying business performs well, if the company doesn’t live up to high market expectations, you’re in for a bumpy ride. Consider an investor who bought shares of Wal-Mart in September 1999 when the stock traded with a price-earnings ratio over 30 times. Though Wal-Mart as a business grew earnings and dividends per share at an impressive rate over the next decade, the stock price didn't fully follow suit because the business performance wasn’t enough to match lofty initial expectations. Formidable competitors like Costco, Target, and Amazon were also chipping away at Wal-Mart's competitive position. Ultimately, Wal-Mart's price-earnings multiple contracted and the 10-year total return was about 2.4%. Potential: Investors can underestimate optionality in a well-run business. Those that considered Amazon, Facebook, or Google wildly overvalued early in their public market histories, for instance, didn’t foresee the new opportunities these businesses would create or discover in the subsequent years. 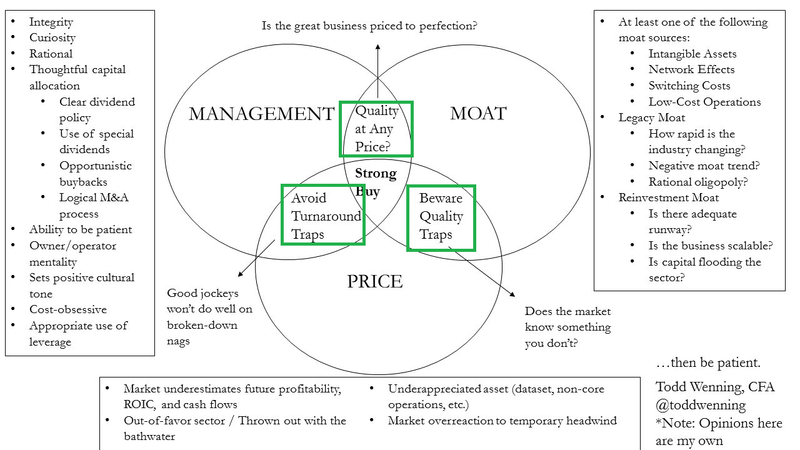 Similarly, firms with existing moats may look expensive now, but if management can further widen the moat, today's price may look cheap in hindsight. Process: Don’t rely solely on relative valuation and market multiples. Instead, make explicit forecasts to determine what the market price might imply. Then, consider whether or not you think management is capable of beating those expectations by introducing new products, entering new markets, becoming more efficient operators, or adding new lines of business. Problem: The market knows something you don’t. Pitfall: Though the stock's premium may have diminished, there could be good reason. The company’s legacy moat could be under assault by new and motivated competition or a disruptive technology. If management is incentivized to protect the old cash-flow-rich operations or if the corporate culture is bureaucratic and stagnant, there could be further to fall. Kodak is a classic example – a former blue-chip darling that had a dominant market position, saw the coming of digital photography in plenty of time, but its culture refused to embrace the change. Potential: A management transition could lead to cultural change, which could reinvigorate the business and make it more competitive. To illustrate, a positive cultural change happened at Sealed Air after the board brought in a new executive team following the controversial $4.3 billion acquisition of Diversey in 2011. In the twelve months following the deal's announcement, Sealed Air's stock price dropped about 60%. Despite the poor M&A decision by prior management, Sealed Air (makers of Bubble Wrap) and Diversey still had some durable competitive advantages. The new management team overhauled the corporate culture and got the company back on solid footing. Process: Ask yourself if the company has a culture of innovation and change. Could a new management team realistically step in or is the board too close to the CEO and CFO? Review management’s incentives and the board structure and determine whether or not they have enough skin in the game to want to improve operations. Problem: Even excellent capital allocators can struggle to fix a broken business. Pitfall: Turnarounds have low odds of success. 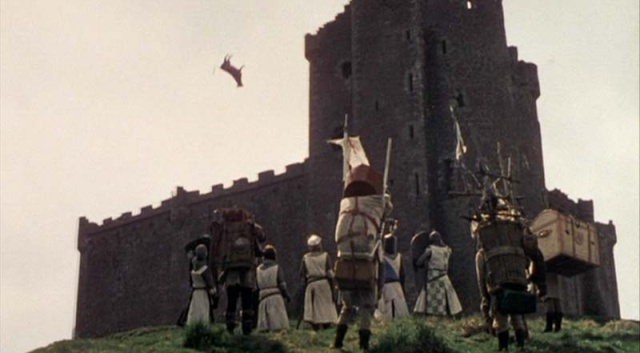 Ultimately, management facing such a situation needs to identify a potential moat source and attack it full force. Then, hope for a lucky break or two. When there are massive secular headwinds in place, this becomes a near-impossible task, even for great management teams. Eddie Lampert at Sears Holdings is a good example. Lampert has done a remarkable job playing a tough hand, but the long-rumored turnaround has struggled as department stores face immense competitive pressures from changing consumer tastes and from online retail. Potential: When turnarounds happen, the rewards can be enormous. Steve Jobs' second stint at Apple is one of the best – if not the best – turnaround story of our generation. Though the full story is more complex than this, what Jobs did was make Apple (traditionally a beloved niche personal computer maker) into a premium global consumer brand, starting with the iPod and later the iPhone and iPad. Jobs' efforts, along with the rest of Apple's staff, spawned a brand (intangible asset) advantage that, when paired with the switching costs created by the iTunes platform, led to a solid economic moat. Process: Is management facing secular headwinds in their core operations? Are industry dynamics stable and asset growth slow or is capital flooding the industry? Does management attempting a turnaround have to reckon with a debt-laden balance sheet or an under-funded pension plan? Rarely will the stars align so that management, moat, and price are all clear and a strong buy is evident. Much more frequently, quality-value investors must wrestle with one of these three scenarios where one factor is missing - or at least isn't obvious. As such, it's helpful to approach the scenarios with both the pitfalls and potential in mind. Weigh the pros and cons, make a decision, and then be patient! The opinions expressed here are the author's and not those of his employer. Todd's family owns shares of Amazon and Costco. For a full disclaimer, please click here.